This week that began largo has flown by presto. I am heading downstairs to the banquet, which is, unbelievably, the conclusion of the NMA reunion. It has flown by too fast. I've caught up on the doings of regular attendees, told stories with old friends for the first time in 25 years, met legends of the Navy Music Program, all to the accompaniment of moving, challenging and just plain fun music. But there hasn't been enough time. There never is. Because many will be leaving early tomorrow--our equipment crew will aim the truck back to Virginia Beach before daybreak--this will be a night for goodbyes. I'll probably stay until the end and will not likely post again tonight. But I'll be here for an extra day, so I'll blog tomorrow with the wrap-up. But they're not all gimmicky toys. Although a true artist does not rely on gimmicks, sometimes a little electronics can ensure you're in the right place at the right time. Vocalist Stephanie Richards's knew exactly when to step on stage duringt last night's concert thanks to a Device that listed the program. And a singer doesn't have to worry about getting the starting pitch for the National Anthem when a Device is handy. The NMA's annual Business Meeting went smoothly. Too smoothly; somethings wrong when scores of MUs can sit together and actually agree. Here are a few highpoints; remember that this is an unoffical report;extreeemely unoffical, consisting only of highlights (fortunately, there were no lowlights). President Terry Chesson opened the meeting by saying that the month leading up to a reunion is always exciting and tense; exciting because shipmates are about to gather, and tense because there are details, changes and glitches to iron out. "And now," he said, "it's almost over, and I don't know what to do." Well, I know what he can do: relax. It's been a wonderful, successful get-together. Next year we'll meet in Virginia Beach, but Bob has already started preparing for the 2014 reunion. Many members would like to meet in the Northeast. Others favor the South or Midwest. Do you have an idea for a location? Let Bob know. Kim Holl reminded us that next year in Virginia Beach we'll hold elections. Kim chairs the Nominating Committee, and looks forward to receiving nominations to the Board of Directors. Speaking of committees, Dennis Allard volunteered to form a Membership Committee to help attract new members. He's looking to form a group consisting of members from all eras of Navy music, from the distant days of battleship bands, from the decades of the unit bands, the not-so-bygone days and those who still put on a uniform every day. 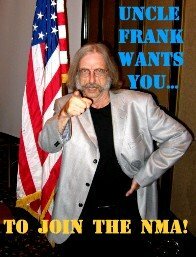 Here's an opportunity for you to help the NMA in its ongoing need to gain members. "Recruitng new members is everyone's responsibility," he said. Of course, each one of us is the NMA's most effective recruiting poster. Dennis's willingness to organize a commitee to focus on this shows that he takes his own words seriously. There being no more business before the metting, and no fistfights having interrupted the proceedings, the meeting was adjourned and members were sent on liberty until this evening's closing dinner and dance. Next: the annual Membership Meeting. The first thing on today's agenda at the NMA reunion is the Membership Meeting, an all-hands evolution. At 1000, we'll meet to discuss the reunion, the present status of our organization and future plans. Attending this meeting is always a good way for reunion attendees to learn about our Board of Direcotrs is up to during the other 51 weeks of the year. I'll hope to give you a report around noon. One thing that won't be a surprise is the location of next year's reunion; as always in odd-numbered years, 2013 will find us in our homeport, Virginia Beach. The concert is over, and it's time to relax. Things, as always, were a bit tense; last-minute scheduling changes kept everyone on their toes. The players put their hearts into it, but three rehearsals is three rehearals. And they were enough. Fron Wilbur Smith's opening downbeat, you knew this concert would be one to remember. The band was strong, balanced, and kept the audience enthralled throughout. I'll hope to soon provide video of Stephanie Richards's rendition of "The Last Measure of Devotion." There were tears in the audience, some of them mine. But they were the good kind of tears, the kind that fall when you're experiencing something powerful. But we're taking it easy now. Soon, things will move to the lounge, where we won't be taking it so easy. The concert band always peaks on Fridays. Now comes a highlight of the NMA reunion, the Friday night concert. Many of us are musically active through the year; others less so. But we all find the musical experience of a reunion to be rewarding and put a lot of effort into making it so. And tonight is the payoff. In a half hour the concert will begin. I am now off to enjoy and participate in this centerpiece of the reunion. It will be followed, no doubt, by jamming in the lounge. I'll be there, too, and I'll get back to you, well, who knows when? Late tonight? Tomorrow? Time flies when you're having fun; in Orlando, it soars. Unbelievably, we are reaching the close of Day Three of the Navy Musicians Reunion. There's much more, including tonight's concerts and social hour, but we are on the homeward leg of this cruise. And, finally, we have some free time. This afternoon we've been on liberty after days of solid rehearsals and jam sessions. Unscheduled time can be dangerous for MUs, but we are gentler and perhaps somewhat wiser than we once were. Some of us went to see the sights this afternoon. Others took the opportunity to relax with friends and tall tales. Jim Richards gives his all to a sea story. Gestures. Dialect. Vivid description. In fact, last night in the lounge, he had me laughing so hard I had to go outside to collect myself. I have not often left a bar voluntarily. Here, Dave Czohara with glee as Terry Chesson reacts to Jim's recollection of the joys of 30-second shipboard showers. ...and what the percussion section sees. Oboe: the ill wind that Barbara Levy blows good. A great advantage to moving our reunions around the country is that it attracts new members from whatever region we may be visiting. This year, Barbara Levy joined us with her husband, Sheldon--also an MU--and, even better, with her oboe. We don't often get double reed players, so it's been a joy to have her here. The first G.F. of the NMA reunion showed itself this morning as we were warming up for our final concert band rehearsal. Through a scheduling error, rehearsal was located in the ballroom adjacent next to a conference of the FIAIA. The manager brought the problem to conductor Wilbur Smith. Smitty didn't waste any time looking for fault; there was no time to waste on assigning blame, so he found the solution. We moved one more room down the hall and started only a few minutes late. I should add that FIAIA stands for "Florida Internal Affairs Investigators Association." These were cops. Lots of them. They had guns. Lots of them. Smitty made a great decision. If you have ever held the NEC 3814, piano, your presence at the NMA reunion is requested. I played more yesterday than I've played in the last two years. An afternoon session in the lounge, an evening dance band rehearsal and an evening session in the lounge. The band was hot, the players in tip-top shape, and I'm exhausted. We're short on pianists this year, so come on down. Think you're not good enough? If you know the changes to "Satin Doll," or, for that matter, if you just know the title to "Satin Doll," you hereby pass the audtion.There's plenty of playing to go around. This morning's rehearsal is the last before tonightt's performance. It's taking a lot of work to prepare; if you think that our experience as military professionals makes concert preparation a breeze, believe me, it ain't necessarily so. On the left, Dennis Bear; on the right, Marty Nau. Dennis's home is Wisconsin, where he plays in a band sponsored by New Horizons, an organization that gives adults the opportunity to play in musical ensembles. Marty's home is wherever gigs, tours, recording sessions and music clinics take him. As Navy musicians, we brought our musical experience to the bandstand and came away with more than we brought. It still works that way in the NMA. It appears that Bill Allen finally got tired of hearing his buddies delivering the old Navy line, "Get a haircut." It's great to have John Vasquez back after a few years. It's also wonderful that a pair of timpani showed up, too. I'm looking forward to hearing "America, the Beautiful" without the percussion section playing the opening timpani roll on castanets. If you heard NMA member Stephanie Richards sing at last year's reunion, you know that this former Navy vocalist can sell a lyric. She's got a lot to work with this year; during Friday night's concert she'll perform "The Last Full Measure of Devotion," a moving tribute to those Americans who have sacrificed without limit. Admittedly, rehearsals of the piece were troublesome until conductor Wilbur Smith identified the problem: every time he called up "The Last Full Measure of Devotion" and gave the downbeat, the trombone section began playing--yeah--on the last full measure. This is more like what we visitors expect out of Florida in the summer. From talking with members who live in the area, it's also more like what people who live here expect out of Florida in the summer. As always, check the gig board. Schedules can--and will--change. Same guys, same horns, same room, but something was differen at this evening's big band rehearsal. The band that rehearsed tonight was smoother than the band that stumbled out of bed this morning. That first meeting was a jittery affair; tonight, the band swung. Maybe it was because the players were warmed up after a busy day of playing. Maybe it was because the horns themselves were warmed up, fueled by a dayful of eighth notes. And, of course, maybe it was because big band music was made for nighttime. That's what the rehearsal schedule says. It doesn't say that everyone will be here yet; it simply says that our time together is precious, and we can't waste it waiting for an alto clarinetist and second bassoon player to walk in the door. So we rehearse as scheduled. It may be shaky at first, but by the end of the afternoon, everyone agrees: a few more rehearsals, a few more players, and this is gonna work. Clarinets--we could use a few more. And three out of four horns is damn good. I was overjoyed this morning to walk into the NMA dance band rehearsal and see Bob Leek at the piano. Bob Leketa was equally thrilled, as we were the only pianists to have pre-registered for the reunion. Believe me, Leketa and I are happy to share the duties; for a pianist at an NMA reunion, there's plenty of work to go around. The 2012 reunion of the Navy Musicians Association is underway. We're not all aboard yet---members traditionally roll in day after day. But we put a big band together, blew the rust out of our horns and got started on schedule. A number of NMA members have reported spotting something unusual in the Orlando sky this afternoon. Various descriptions have included the adjectives "astounding" "gorgeous" and "encouraging." Common among all the sworn and signed affidavits is the word "blue." Impromptu jam sessions in the lounge are a hallmark of Navy Musicians Association reunions. In fact, although the reunion doesn't offically start until tomorrow, enough of us are here to get started tonight. Our sessions are lively affairs that we look forward to all year long. We love them so much that, sometimes, we all want to play on every tune. As a pianist, however, I assure you that a seven-horn section is four horns too large. A parade of horn players who each want to solo on a chorus or two means it can take the "A" train a half an hour just to get out of the station. We rhythm section players are equal partners, not hired providers of endless Music Minus One accompaniments. That's what we think, and apparantly, someone else thinks so, too. I just stopped by the lounge and saw a sign next to the bandstand. It's a light, polite reminder--a lot lighter and politer than the one I would have written. "This is like Thailand during monsoon season." "The ceiling in the lounge is leaking." "Look, it's stopped rain--oh, guess I spoke too soon." "I saw a patch of blue sky this morning." "I have to get my sax out of my car--can I borrow your poncho? "I heard this will end tomorrow." "I heard pigs can fly, if you tie jet-packs on their backs." I still have no word on whether my nemisis, Lee Hudson, is coming to the NMA reunion. If anybody talks to Lee, please tell him the hotel has arranged amenties just for him. The early birds are filling the nest. Deb Holl is opening the registration room at noon today, so early birds can check in for the NMA reunion. And we are arriving in droves. Well, small droves, but still. The Gambles just pulled up to the hotel. Rehearsal Director John Branham looks wonderful--he's lost a lot of weight, and claims to have left half of it back in Indianapolis. His wife was with him, so it's clear that what he left home wasn't his better half. And, of course, everyone has brought their electronic Devices. They read them, listen to them and, in the Case of Deb Holl, talk to them. It's a new world. NMA President Terry Chesson introduces the Martells to his Device. Yesterday, in a moving ceremony in the lobby of the Orlando Doubletree Universal, NMA Executive Vice-president Bob Leketa swore in Leon Harris as the organization's Equipment Manager. Pinning on Harris's new nametag, Leketa administered the oath that accompanies elevation to this position: "I hereby invest in you the repsonsibilities that accompany this challenge, knowing that you will exert you authority with a zeal and dedication that reflects the highest traditions of the Navy Musicians Association." Actually, what he said was more like, "Now get your #%&! * to work." You won't have trouble finding nearby restaurants during your stay at the Doubletree. In fact, you'll find a number of options right here at the hotel. I think I saw something out the window. Tropical Storm Debby took a few minutes off today, long enough for the observer to note, for the first time, that this is actually Florida during the early summer, not the Phillipine Islands during monsoon season.